I started training jiujitsu at Pride Fitness Centre in Dubai, United Arab Emirates on 22nd July 2013 under Carlos Calderon Team Aranha Dubai and I’ve been hooked ever since! Today, I’m a 3-stripe white belt under Eric Ramsey & Cameron Knight – SAS Team Dubai at Pride Fitness Centre. My goal for 2015 season is to become a white belt world champion! I’m aiming for gold!! Double gold at the Abu Dhabi World Pro and double gold at the World Jiu-Jitsu Championship in Los Angeles fighting at 66kg. I know it’s a tall order, but that’s exactly what I love about this: I like to set very challenging goals and do my absolute best to reach them. This has always been my strategy as a TV/Live Events Presenter and it has worked very well for me – so why not try it in sports as well! I train jiujitsu 6 times a week and I drill as often as possible with my awesome teammates and I also do a fantastic conditioning class three times a week. I currently fight at 70kg so this means I’ll be dropping a weight-class, conditioning and training really hard to reach my goals. 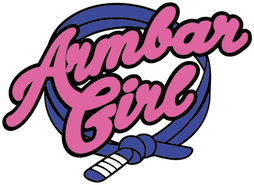 On ArmbarGirl.com you’ll be able to follow my journey in jiujitsu from a 3-stripe white belt to hopefully a black belt one day. From conditioning workouts, to drills to jiujitsu PT, jiujitsu group class and everything in between – you’ll see it here! Get ready to see a lot of pictures and videos! I’m Johns Dad in Australia. I’v watched you on Facebook and you are an inspiration!! !